LaurensvanDuijn 01/12/2015 18/05/2017 4 Comments on Guide: How to create an AppStack in VMware App Volumes. 1. Check of your capture machine is powered on, has the agent enabled and has been set with a snapshot to revert to after capture. 3. Click on the Volumes tab. The first tab on the volumes tab is App Stacks. All provisioning and management is done from this tab. 5. Name the App Stack and select the datastore where it will be stored. Click Create. 6. You will be asked if you want to create the disk in the background or wait for it to complete before moving to the next screen. Choose Perform in Background and click Create. 7. After the App Stack has been created, it will show up in the list of App Stacks with a status of Unprovisioned. 8. Click on the plus on the left of the App Stack name. Click provision to start the provisioning process. 9. 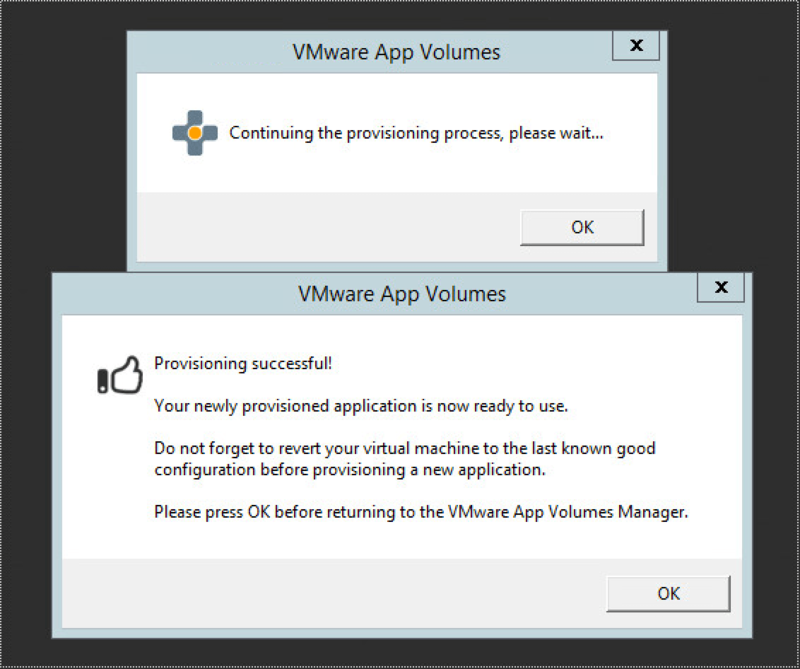 You will need to select the VM with the App Volumes agent installed which you defined to act as the provisioning machine. Just press search and all your provisioning systems will pop up. 10. Select your capture machine and click Provision to continue. 11. Sign into your capture machine. 12. When you sign in, you’ll be presented with a dialog box stating that you’re in provisioning mode. Click OK to continue. 13. A second box will pop up asking if you have finished installing your application. Ignore this box for now, but do not close it. 15. 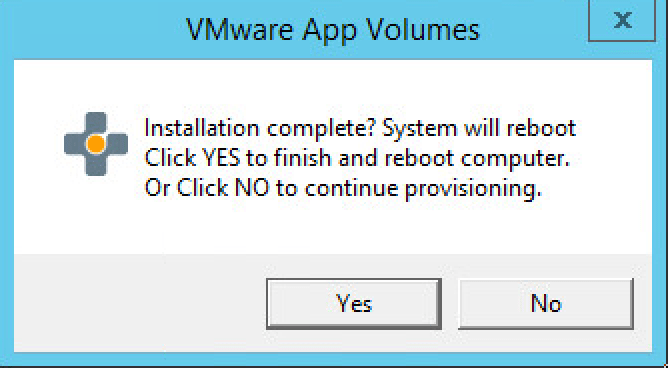 When you’re finished installing your applications, click Yes on the “Installation Complete?” dialog box that we “ignored” before installing applications. 16. A reboot prompt will appear after a first prompt appears that is analyzing the installed applications. Click OK on reboot. 17. Sign into your capture machine after it reboots. After signing in, you’ll be presented with 2 dialog boxes informing you of the status of your application provisioning. Click OK.
18. Go to the App Volumes Web interface. Find your new application on the App Stacks tab, click the plus sign to the left of the name. You should now see options to assign, update, and edit the App Stack. And your captured applications. In my case VLC, Notepad++ and Adobe reader. 19. Click Assign to assign the application. 20. Enter the name of the Active Directory object that the App Stack will be assigned to and click Search. 21. Select the AD object and click Assign. You can select multiple objects if preferred. 22. After clicking assign, there will be a prompt on when the assignment should take effect. The two options are: to take effect on the next login or reboot or to take effect immediately. Select the best option for your created stack and click Assign. Once you click Assign, the application will be available to the users or computers. When confirmed that your new AppStack is correctly created do not forget to revert back to you base snapshot on your capture machine. This just showed you the basics of configuring App Stacks. DJI Agras MG-1 Drone, A farmers friend in the sky. Have you ever seen the provisioning window not pop up on the template vm? I’m having this issue now. The agent is installed and it shows up in the console, but when I create a new app stack and start the provisioning process, I never see any popups on this workstation. It is domain-joined. I do see the VMDK get attached, but I never get a popup from the agent. 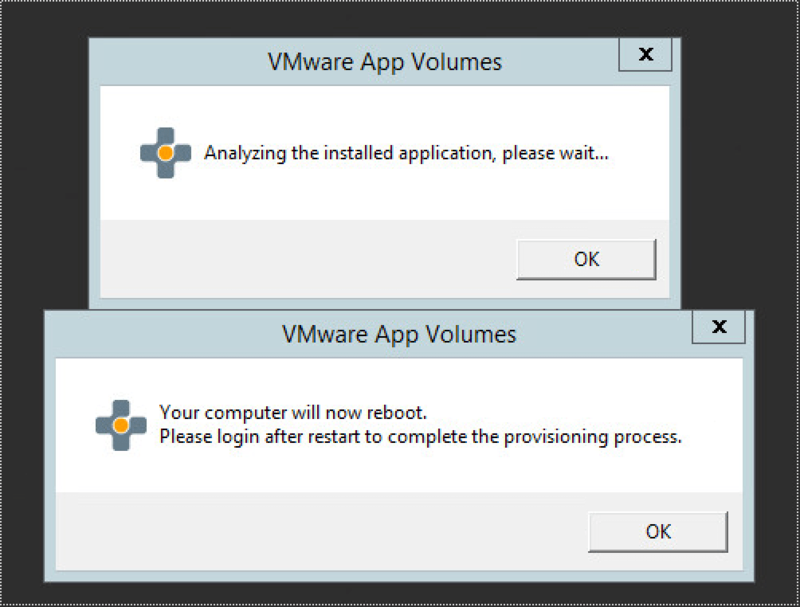 Which version of app volumes are you running? agent installed correctly? firewall not blocking connection to App Volumes Manager?